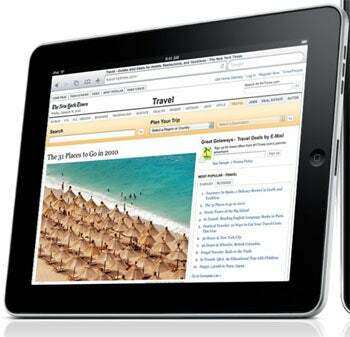 Apple's iPad has been surrounded by debate since its debut this week. Now, the heavily hyped tablet is at the center of a controversy that's reaching the federal government. This latest iPad beef isn't about the device's frequently mocked name or any surrounding trademark concerns; rather, it's about the iPad's apparent lack of Flash support. Product demos and statements from Adobe suggest the device is not Flash-friendly -- but Apple's promotional materials paint a very different picture. The iPad-Flash disconnect first came to light by way of Apple blog AppleInsider.com. The gang at AI noticed that promotional images posted on Apple's Web site appear to depict the iPad displaying Flash-based content from NYTimes.com. A promotional video posted at Apple.com also shows what appears to be that same Flash-based content loading fine on the iPad. That same content, when accessed on an iPhone or iPod Touch, returns an error stating that Flash is required for viewing. 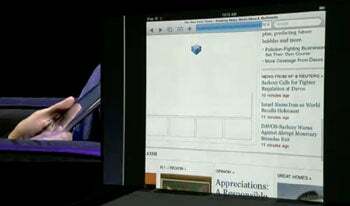 Furthermore, as AppleInsider observed, those portions of NYTimes.com did not load during Steve Jobs' demonstration of the iPad at Wednesday's Apple event. You can see an empty Flash box in their place at about 1:19 into this YouTube clip. "There's something important missing from Apple's approach to connecting consumers to content. ... Without Flash support, iPad users will not be able to access the full range of Web content, including over 70% of games and 75% of video on the Web. If I want to use the iPad to connect to Disney, Hulu, Miniclip, Farmville, ESPN, Kongregate, or JibJab -- not to mention the millions of other sites on the web -- I'll be out of luck." Adobe's official Flash Platform Twitter account also sent out a link on Thursday to a news story that explicitly said the iPad "lacks support for Adobe's Flash software." Adobe's tweet described the report as "sum[ming] up nicely Flash and iPad." Paul Threatt, a graphic designer from Atlanta, wasn't too pleased with the apparent disparity between Apple's promotional materials and its actual product. He decided to file a complaint with the Federal Trade Commission. "It definitely struck me as misleading," Threatt tells me. "They know it, everybody in the industry knows it, and I just wish they would depict the capabilities of the product accurately when they're promoting it." Threatt's complaint makes his concerns perfectly clear. "In several advertisements and images representing the Apple products in question, Apple has purposefully elected to show these devices correctly displaying content that necessitates the Adobe Flash plug-in," it says. "This is not possible on the actual devices," it continues, "and Apple is very aware of that fact. Despite the controversial lack of support for Adobe Flash on these devices, Apple has elected to depict these correctly utilizing the Flash plug-in. This constitutes willful false advertising and Apple's advertising practices for the iPhone, iPod Touch, and the new iPad should be forcibly changed." Apple, incidentally, has come under fire for misleading advertising before. An iPhone ad was banned from the airwaves in the UK in 2008 after the country's Advertising Standards Authority said the spot misled viewers about the phone's content-displaying limitations. The ASA also slapped down a 2004 Power Mac G5 commercial after it determined it contained misleading claims. So will the iPad change the world, or will Apple change its tune? Being that Apple's media relations team is notoriously unwilling to relate with the media, we'll have to wait for time to tell us the answer.